When I was growing up every Easter eve, my cousins, sisters and I would make easter baskets with whatever bits & pieces were at hand. The next morning we would wake to discover that Easter Bunny had hidden them and we needed to find the chocolate filled baskets. Every Tuesday morning Frog, Bear & I head along to playgroup. I like to pretend that I go so that the kids can play with other kids, but in reality, they do that often, at many other places. I really go for me. I go to hang out with a fantastic small group of down to earth & supportive women who really have become such wonderful friends. Last week at playgroup we made easter baskets using old soft drink bottles and had a lovely egg hunt around the gardens of the playgroup. 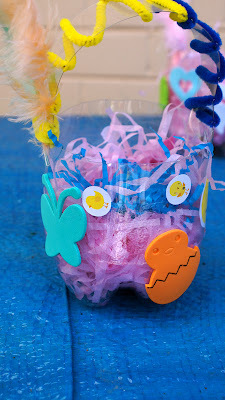 To make your own recycled easter baskets, you’ll need an empty 1.25litre plastic soft drink* bottle. Using a stanley knife** or a pair of kitchen scissors, cut off the bottom of the plastic bottle. Then, to make the handle, cut another strip, approx 1.5 inches wide from the bottom of the remaining top half of the bottle. Attach this strip to the bottom of the bottle to make a basket. You can use a stapler here or punch a hole into both the handle and the basket and join them with ribbon or string. Decorate to your hearts desire. Yes, I decorated one too, I just couldn’t help myself! I had to make a sample after all. We’ll be keeping our baskets and leaving them out on Easter Eve in the hope that Easter Bunny might find them. 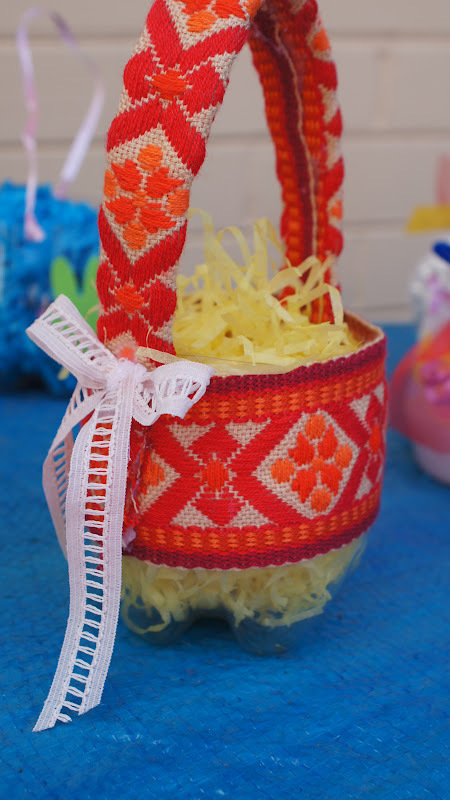 What Easter traditions did you have when you were growing up that you have revived with your own children? * That’s soda for my friends in the US. However, this would work with milk cartons or juice bottles also. ** & that’s a box cutter for my US friends.